Grooming oneself is often not in the cards for an overweight cat. For many cats, there are such things as too much grooming, too many car rides and way too many belly rubs. But too much food? That's nonsense. Overfeeding your felines puts them in danger of serious health conditions and makes them unhappy. It's also difficult to stop. 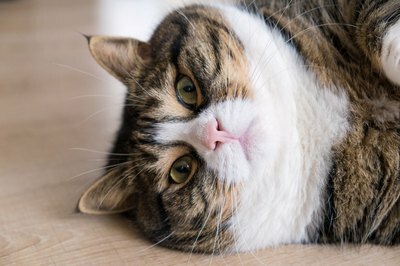 Overfeeding your kitties causes their weight to balloon, putting them at risk for a long list of dangerous and even fatal conditions. Obese and overweight cats suffer from the same problems overweight and obese humans do. Diabetes, joint breakdown, cancer, teeth problems and liver disease can plague your overweight meowing friends. Many of these problems are lifelong, so feeding your feline a more weight-conscious diet after the problems set in won’t reverse the conditions, although it often stops them from worsening. Having your cat plop down in the middle of the living room and proceed to lick her behind might not impress your friends, but her grooming habits keep her happy and clean. When she takes in enough food to make your garbage disposal jealous, her big belly puts a stop to those grooming habits. As a result, her hair can become matted, which causes her lots of pain, she'll sport a poor-looking coat and she’ll likely carry pieces of feces in her hair throughout your house. Poor grooming can also lead to acne. Cats love to jump on counters, claw at scratching posts and occasionally tear through the house like psychos. Overfeeding your cats prevents them from partaking in such awesome events. Struggling to jump and packing on too many pounds to play with toys or dull their nails on posts leads to very unhappy kitties. Your felines will become stressed because their weight effectively limits them from being a cat. They go from leaping onto your bathroom sink for a drink to lazily walking along the floor and sleeping all day. Good cat food isn’t cheap, and constantly filling your kitties’ bowls to the brim with that tasty food will put a small dent in your monthly budget. Bad cat food is fairly cheap, but offering your felines shoddy food worsens the problem of overfeeding. The real money vacuum comes when the inevitable vet bills from the aforementioned health conditions pop up. Tests, prescriptions and vet visits can quickly put you a few hundred or a few thousand dollars in the hole. Just as if you would indulge in junk food for a long period of time, consistently overfeeding your cats makes cutting back their food intake difficult. They’ll whine, cry and constantly annoy you for more food until they adjust to a new schedule. Some cats go to extremes when they feel they need food, and fight with each other, knock items off your counters and generally act terribly rotten. Consult your vet to come up with the best strategy of changing their feeding schedule. Timed feedings work well, and you may need to feed each cat separately. How Much Should a Cockatiel Eat?